If God ever made anything better than the hurling, he kept it for himself. Limerick take Liam at last after another epic poem of a match. Limerick at long last. It was a day when thousands watched the silver screen in the open air cinema that was the Gaelic Grounds. This was a thriller. The Children of The Sorrows rejoiced and paid homage to every clash of every ash, to every thundering Treaty thud, to every wristy flick of every Limerick stick, to every puck and every point, to every block and every stop and every treasury of every one of their three golden goals. This is our game from time immemorial. This year's hurling championship is probably the most memorable in a long time and the last 20 minutes of this one was the most exciting game ever played. Out there on Limerick's home pitch, Joe Canning's late goal was greeted with a sound no louder than a nun's sigh in the cloisters of a silent order. You could see the look of abject terror in Limerick eyes. Was it to be the same old sad story, all over again? But then Graeme Mulcahy scored what turned out to be the winning point. The wait is over, Limerick is whole again, reborn and renewed. Limerick did it for Joan Ryan and the many like her. Joan was dressed in a lovely green knitted cardigan. She is every bit the lady with the smile and the heart of a young girl. Joan never missed the pilgrimage to an All-Ireland with her husband Patrick. He's a Treaty Sarsfield's man. Patrick isn't well but Joan came to the Gaelic Grounds for her man and for her county. She gives a great hug. Anne Reilly kept her Limerick name for the day. Her three kids were green from top to bottom. There was a lovely moment when Anne's husband put his arm around her just after the national anthem. As a Mayo man knows the pain only too well and so it was he minded Anne. Their little boy slept through it all. The cheering for Mulcahy's goal could have raised the dead and those that were there began to believe they would get to see Limerick win a Liam before they died. And maybe the little dreaming boy was dreaming of Limerick winning an All-Ireland at last. Dreams really do come true. There was a treaty broken in Limerick in 1691 and a giant stone bears testimony to the treachery. These loyal Limerick supporters were glued to the giant screen and glued together by an unbreakable bond. They kept their word. Today in Croke Park as well. And the team kept their side of the treaty of communion. So many stories of the long wait. Before the movie of The All-Ireland final we met John Leahy who taught hurling in Causeway Comprehensive. John was drenched in Croke Park back in'73 when Limerick last lifted Liam, and he too was ticketless. "All I ever wanted for the last 45 years was for Limerick to win an All-Ireland. And failing that, Tipp to be beaten." Hurling lifts us and tells us we are indeed a people who can be rightly proud of who we are. The heroes of Galway and Limerick emptied out every drop of passions pledge in our holy place, where sacrifices are made out of limb and sinew, muscle and bone, for home and fatherland. Canning kept his head and scored seemingly at will, while all around were hitting wides. Aidan Harte from Gort kept on giving. James Skehill threw himself in front of a flying sliotar. He took a bullet for Galway. The Tribesmen died like All-Ireland champions should. Like men. There was a sense of a wild and untamed Ireland and even pagan Ireland in those last few minutes. Yes there are referees and don'ts but hurling is about dos and derring -dos. For no other game can set us free from the conventions of conformity. Last week I met a young Kerry mother who was charged €50 to bring her 7-month-old baby in to the Galway game in Croke Park. I have involuntarily touched bellies with men with fat bellies on the way to my seat. These men and women with big handbags are a far greater risk to health and safety than a small baby. The good news was a Galway supporter gave the mother his own ticket for the baby. This was a tax on motherhood but today was the greatest free show in Limerick since The Pope came here, back in 1979. Limerick City Council and Limerick GAA paid for all. They could easily have charged €20 a head but they didn't. There are some who never broke the treaty with their own people. 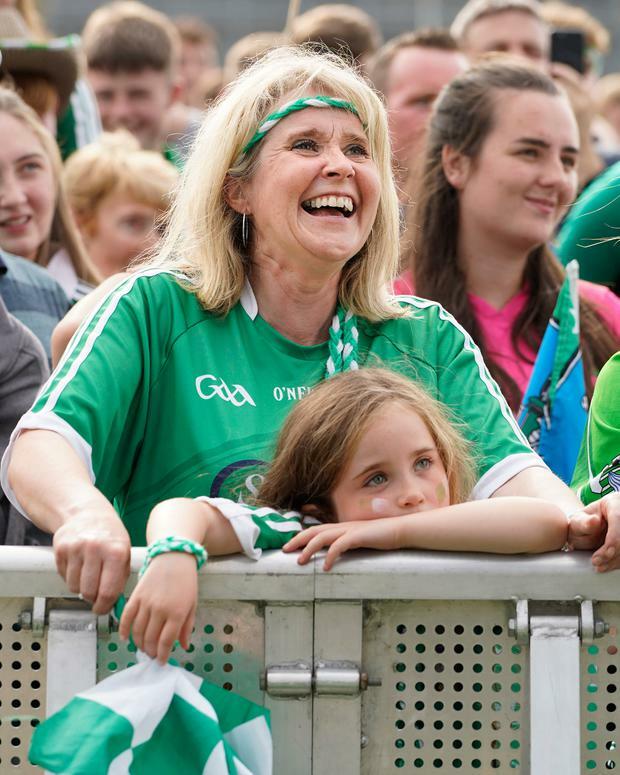 Limerick may not have corporate boxes or fancy restaurants or duck a la feckin orange ,but it has a heart and today thousands of hearts pounded as one. In 1973 a young Limerick team won the All-Ireland and as Eamonn Grimes lifted up the cup on a rainy September day, hardly anyone present could possibly have imagined twoscore and four years would scroll by without a Limerick win. There are new heroes now but the heroes of '73 will never be forgotten either. Nickie Quaid's Dad rests happy in heaven tonight. His boy is the Stephen Cluxton of hurling. It was a day for old ghosts and new heroes. Declan Hannon from sweet Adare, led from the front. Declan raised the Liam MacCarthy Cup over his head, and in so doing he lifted the weight of 45 years off a county's shoulders.